Read on to see what the pros have to say about Uncle Vinnie's. Our annual Readers' and Critics' Choice Restaurant Poll takes you all over the state to some of our favorite restaurants. The results of our 28th Annual Readers' Choice Restaurant Poll were tabulated by PriceWaterhouseCoopers in Florham Park. The winning restaurant in each region received the most votes in its category -- in some cases there were ties; in some categories we also list a chain winner. We have also added our critics' picks. All readers who submitted a ballot became eligible to win dinner for two in our random drawing. This year's winner is Bill Hutchinson of Chester. He will receive a gift certificate to Blu in Montclair, the Best of the Best in the north region. 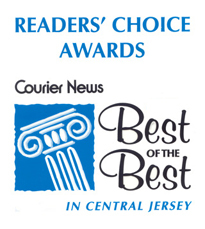 Uncle Vinnie's Clam Bar is proud to announce that we have been chosen by readers of the Courier News as having the Best Seafood in Central Jersey for 2011. Thank you to all of the reader's who voted for us, your patronage and encouragement is greatly appreciated. Send Uncle Vinnie a Love Letter! Are you crazy about our clams casino? Does a craving for our penne vodka keep you awake at night? If you love Uncle Vinnie's as much as we do then tell us what you think! Please e-mail us at testimonials@unclevinniesclambar.com & you could see your thoughts posted right here on our website. Scroll down to see what all the buzz is about. Well I am one that likes change, however, one thing that I hope never changes is Uncle Vinnie's. We came from from Charlotte to spend Christmas with the family. It was great to walk into Uncle Vinnies and be greeted by Louis with a big hug and greeting of, Welcome Home. The family had a great dinner on Friday, Dec 26th and as usual everything was well prepared and the service was excellent. Thanks Lisa. We got to see Lois which was a treat for us as we had missed her the past few times we stopped in. Amanda also welcomed us home and it was just so nice to see everyone. We look forward, when we come into town to visit Uncle Vinnie's as there is no Uncle Vinnies in Charlotte. Lois, Chris, Lisa, Amanda and Louie, thanks for making this a very great evening for the family. Hope to see you soon. Hope all have a very happy and healthy New Year. Love to all of you. UV's is #1!!! I can't rave enough about the great food and ambiance. The staff are awarded the gold triple star. Seafood is always fresh and made to order. Great food, awesome times!! Don't tell anyone! It's my favorite place in NJ!! The best restaurant in Somerset County! "Uncle Vinnie's has always been my favorite restaurant (and that's coming from one of the pickiest eaters around)! Every time someone asks for a good restaurant I am like are you kidding - Uncle Vinnie's of course! I have referred several people now and no one has ever been disappointed. My husband just asked what do you want for Valentine's Day dinner... Uncle Vinnie's of course! Keep up the good work guys!" "What a hidden gem! The food and the service are superb. I highly recommend Uncle Vinnie's. I will be back!" "Thank you for having me at Vinnie's back in October. It was a truly memorable American and seafoodie experience. I loved the atmosphere, and couldn't believe how extrovert everyone was. I was welcomed by complete strangers...noisy (in a very good way), happy strangers who weren't at all shy. How different from New Zealand!! You folks do atmosphere very well!! I'll be back in a couple of years to show my husband where the Tee shirt came from...he won't believe your restaurant!!!" "I was in town recently for business and patronized your restaurant. I truly enjoyed dining with you. The atmosphere was very pleasing and the food was fantastic. I intend to dine there again if my business brings me back to your area. I travel a lot so I am tired of eating in chain locations and enjoy a more local flavor which you really did very well." "I can only say that being Italian, food has to meet the following criteria, "If I am going to put it in my mouth its got to taste good." I have left Uncle Vinnie's many times saying to the bartender, "That was a 12 on a scale from 1-10." The food is always fresh, hot, and hits the proverbial spot. The staff is courteous and friendly; and the prices are reasonable. What more could you possibly ask for? It's one of the best kept secrets in NJ." "This place rules! The food is amazing! The wait-staff is amazing! The owners are the friendliest people ANYWHERE! You have to try Uncle Vinnie's!" "Last winter, I heard myself asking the bartender, "What is a hot chocolate martini?" I guessed the answer was simply a martini that tastes like hot chocolate. But, I couldn't imagine that it was possible. Well, guess what... it was hot, chocolately, and very much a martini - glass and all. It was quite tasty and made me feel nice and toasty! That was what I was recommended, and chose, for dessert after the sumptous dinner I just enjoyed. Over time, I've had a variety of appetizers and entrees. I loved everything I tried: the seafood salad was unbelievably tender and delicious - scallops, clams casino done to perfection, shrimp scampi with just the right amount of scampi sauce, and specials like whole steamed lobster, succulent swordfish steak, and more! I grew up spending summers on LBI and frequently had fresh seafood - and loved it. Uncle Vinnie's Clam Bar saved me a trip to the Jersey Shore! I highly recommend UVCB to all of my friends and work associates, as well as Uncle Vinnie's Market - where I had my first (but certainly not last) soft-shelled crab sandwich for lunch, and bought some gifts items including a UVCB t-shirt for myself. The atmosphere is fun, the food is the best and always real fresh (cooked superbly), and the staff is so upbeat and friendly. I recently married and my wife and I included UVCB in our extended celebration. We both enjoyed it very much and can't wait to go back. Oh! One more thing... if you get there late, it's worth the wait!" "We've been to Uncle Vinnie's twice since this is a local place for my brother, Bob. We went there on our own for New Year's Eve and had great service. Everyone is always friendly and eager to please. The clientele were also fun. The clams oreganato are out of this world. We lost our credit card there and quickly had it returned to us by mail. The fish is fresh, the atmosphere comfortable and just great food. We'll definatley return." "We just want to let you know how much we enjoyed our recent visit to your establishment. The welcome, fare, service, and ambiance were all outstanding. In particular the freshly cooked fish and accompanying food were a credit to the Chef and his assistants. Of all the food outlets we visited during our recent two week sojourn in the USA, Uncle Vinnie's was head and shoulders above the rest. It was a real treat and somewhere to return on our next visit. Congratulations and keep up the good work! "Uncle Vinnie's is such a great dining experience... the food is amazing, the service is top notch, and the atmosphere is relaxed and fun. My husband and I have been there several times and have never been disappointed. The fried calamari and the fish dishes are cooked perfectly, so light and fresh. It's always a joy to see Lois (manager). She greets you with a smile and a warm welcome. A couple of doors down you'll find Uncle Vinnie's Market where you can sit down or get a takeout order of lightly fried shrimp or clam strips - delicious. Do try the crab cakes. The best we've had. Uncle Vinnie's Clam Bar and Uncle Vinnie's Market are family-owned businesses. When you put the love of family, friends & good food together you can't go wrong. See you soon." "My Girlfriend and I eat there AT LEAST once a week and the food is ALWAYS great and the portions are huge. The Staff is the best, they great us by name and have a drink at the table before we even ask. The prices are very reasonable and we just love this place. Do yourself a favor and make your way to Vinnie's and come hungry!" "Remember Cheers? "Where you can go and everybody knows your name." That's Uncle Vinnie's, the best bartenders and wait staff in New Jersey who act like they're always throwing a party as opposed to working a restaurant shift. Seriously, there is a buzz in this restaurant that just keeps you smiling all the while you're there. As for the food... those little guys that you see in the back working the broiler are the hardest working chefs I've ever seen! And the food they put out is exquisite. I discovered Vinnie's three years ago and make it a point to go at least 4 times a month... easier now that I can do lunch at the new Uncle Vinnie's Market next door. Scrumptious choices. So its FIVE STARS for Uncle Vinnie's Clam Bar... you won't regret it for a second." "I take a trip from Philadelphia to Uncle Vinnie's at least once a month. I've been to clam bars from New York, to Philly, and the Jersey Shore, and Uncle Vinnie's by far is the best I've ever had. Their Seafood Salad is amazing and the portions are huge (you leave with a doggy-bag, never hungry). They always have very creative drink specials. See you guys soon!" "A taste of NY Little Italy style hot sauce and a whole lot of Jersey Shore seafood freshness in RARITAN, NJ. Some of the best seafood and shellfish north of exit 100! If you consider the prices and portions your could say north of Cape May! We used to drive all the way to Vincent's in NYC, or Mud City & Ship Bottom Shellfish in LBI for this kind of seafood. Now we can have it year round at this family restaurant only a few minutes from the Bridgewater Commons Mall and the Somerville , Circle (Rt. 202/206) in Raritan. People come from Belmar and Point Pleasant to eat here! Call the sauce... SAUCE or call it gravy... Well prepared menu items include: Sea Scallops ("dry" scallops for those who know) pan seared and served over spinach with vinaigrette. Scungilli with a NY hot or "sweet" sauce. Very affordable and done right! Monkfish, Blackfish, Lobster and a wide assortment of seasonal specials. Zuppa di Pesce & Crab cocktail with a great horseradish bite. Seasonal items like Soft Shell Crabs, raw bar clams and oysters, try the local favorite "Clams Casino Trenton". Open kitchen (all of the food prepared in full view) features a lively bar with relaxed very friendly and attentive service. Well stocked bar with great Martinis (shaken or stirred?) Steve the bartender will set you up with a full size libation... not half a glass like you may get at other seafood restaurant chains. Two doors down you can dine in with a seafood sandwich while you wait for your take-out order of fresh fish from Uncle Vinnie's seafood market. One thing we always notice is that the place is CLEAN. Immaculate. Even the bathrooms sparkle. Lois (the manager/owner and her dad are the best!). Family heart makes a huge difference in how this place works as it has for nearly 20 years." 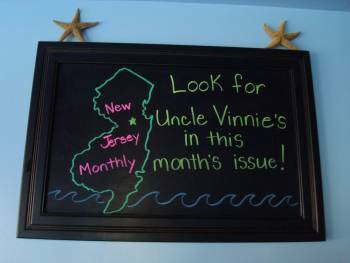 "We recently returned to NJ for a visit and was recommended to eat at Uncle Vinnie's. What a pleasant surprise. The atmosphere was friendly and inviting. The staff could not have been more professional and fun. The food? That had to be the best seafood I have ever tasted! I grew up down the Shore and have been all over the world and I can honestly say their chefs are true masters of the trade. The fish was light and fresh. Everything came out on time and did not overlap making you rush. A truly outstanding dining experience. Thanks to all for making our trip home a pleasant and unforgettable one. We'll be back!" "This past Saturday night was our first time ever at Uncle Vinnie's. Recommended by a friend and never even knew it existed. All I can say is... WOW!! Super friendly, knowledgeable staff. Fairly priced drinks. Food prepared right there in the same room by obviously talented chefs (the aromas are great teasers... I wanted to try every dish that passed us on its way out!). Portions are very generous and the variety is just right. The food itself was AMAZING!! Cooked to perfection, not overly seasoned and steaming hot. Probably the freshest seafood inland. The calamari was tender and very tasty... no rubber bands on THAT plate! Don't forget to try the Cannoli... Last but certainly not least was our hostess for the night. Turned out to be the owner's daughter Lois, who was a pleasure from "Hello" to "Goodnight". Thanks and see you soon!" "I recently again visited one of my favorite restaurants in Central New Jersey, Uncle Vinnie's Clam Bar in Raritan, NJ. With a menu featuring Italian seafood, it is a destination for dinner that you won't want to miss. All of the food is delicious, but my two favorite dishes are the clams' casino Trenton style. My friend Hector from Hillsborough introduced me and our friend Patrick from Chicago to this dish and we now have it on almost every visit. My other favorite is the seafood salad. The seafood salad comes in two sizes, but the small can frankly feed two, especially if you are having it with an order of the clams' casino Trenton style or another appetizer of your choice. My friend Lorraine comes from Manasquan for the seafood salad, so that should give you some idea of how special it is! The atmosphere at Uncle Vinnie's is also very inviting, and the manager, Lois Ricci, runs a very friendly yet professional operation. Try to avoid the rush, as the restaurant is small and they don't take reservations. Arriving before 6:00PM is best or try lunch on Friday, as that is the only day that they serve lunch." "As a busy professional often commuting from Ann Arbor, Michigan to New Jersey, I was pleasantly surprised by Uncle Vinnie's Clam Bar's upbeat atmosphere and great food. My favorite dish is the pan seared scallops over a bed of fresh salad, which is delicious and light for my late night dinners. Most of the main-course dishes are reasonably priced which can attract families and regulars. The oysters, clams and lobsters are so fresh that you can taste the sea. I also enjoy the relaxed but attentive service - cheerful, precise, and perfectly paced on my frequent visits. This fine establishment has provided the warmth and nourishment which make me feel at home. Great job to the manager, Lois Ricci!" "We had a delicious dinner on Saturday night, it was the best that we have had in a long time. Loved the atmosphere, sat at the bar and enjoyed our dinner. The staff is super friendly and professional. Would definitely go back and recommend others to dine there as well." "As a computer consultant I travel all over the United States and as a result get to check out hundreds of restaurants. As a bonus I get to meet a lot of great people and have to mention my good friends Glenn and Hector, as they are responsible for taking me to Uncle Vinnie's for my first time. I have to say without a doubt that Uncle Vinnie's is one of the great restaurants I've had the pleasure to eat at. The food is fresh, the staff is professional and courteous and the cooks are on top of their game. I highly recommend the Clams Casino, Trenton Style, you'll find no better anywhere, this I guarantee. 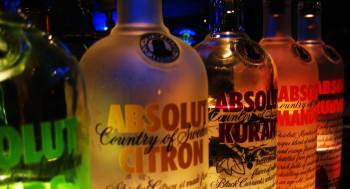 They have a great selection of drinks from their bar as well. Get there early or be prepared to wait!" "We have been going to Uncle Vinnie's for years and the quality of their dishes has never let us down! Best clams casino, anywhere! These people know their seafood!"